Страницы: Пред. 1 ... 10 11 12 13 14 ... 43 След. на северном полюсе виден лёд. Аааа... Да, борозда там есть. Разлом? Пол-астероида пересекает. Но мне больше интересен купол в верхней части. Это гора? Обождите. Это может быть просто очень светлый грунт - там молодой кратер с крутыми склонами. Грунт осыпался и обнажил вещество, которое ещё не потемнело от радиации. Это глыба, раньше Рюгу не принадлежавшая. Красивая каменючка. Не то что та. EDITOR’S NOTE: Upd ated June 21 with new images. 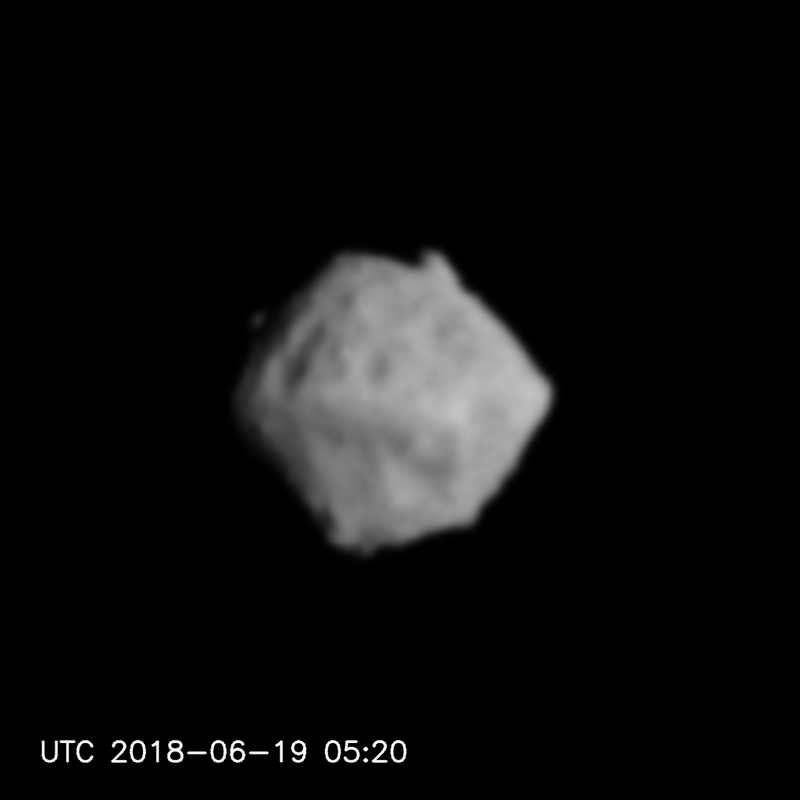 These views of asteroid Ryugu were taken June 18 through June 20 by the Hayabusa 2 spacecraft’s telescopic optical navigation camera, showing the rotating object as the probe approached. Credit: JAXA, University of Tokyo, Koichi University, Rikkyo University, Nagoya University, Chiba Institute of Technology, Meiji University, University of Aizu and AIST. In the final days of a three-and-a-half year pursuit, Japan’s Hayabusa 2 sample return spacecraft is beaming back clearer images of asteroid Ryugu, an unexplored object that scientists say resembles a spinning top or dumpling nearly 180 million miles fr om Earth. 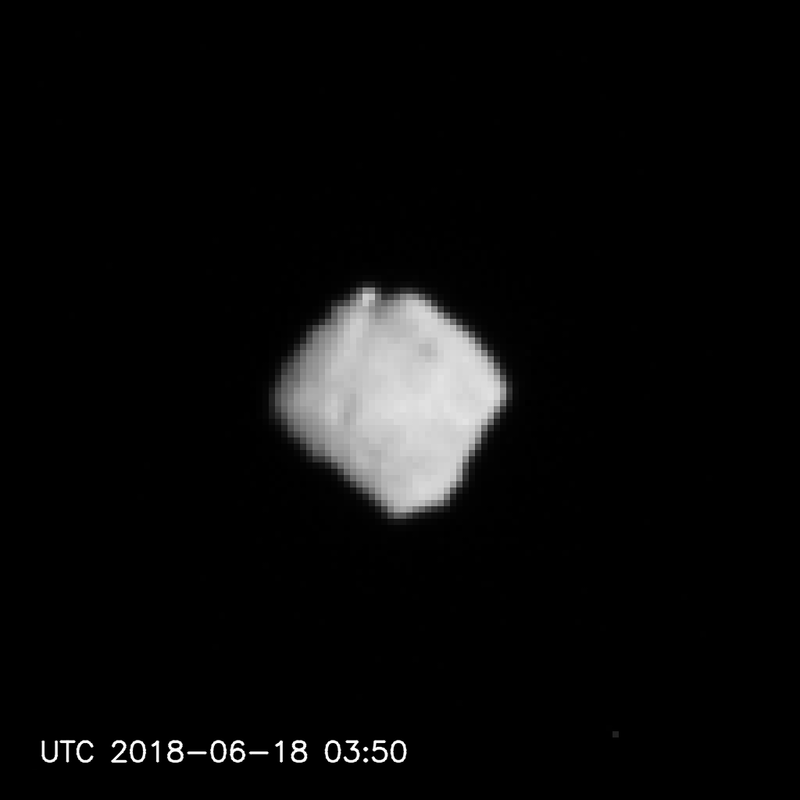 The approaching Hayabusa 2 spacecraft is revealing Ryugu for the first time, sharpening views of an asteroid scientists hope to sample later this year. The nearly 3,000-foot (900-meter) wide asteroid has never been visited by a space mission before now. Launched aboard a Japanese H-2A rocket on Dec. 3, 2014, Hayabusa 2 is Japan’s second space mission dedicated to bringing samples fr om an asteroid back to Earth. The mission’s predecessor, named Hayabusa, returned microscopic specimens from asteroid Itokawa in 2010 after a series of malfunctions prevented it from capturing the planned amount of material. Hayabusa 2 launched with several major improvements, and instead of going to a stony S-type asteroid like Itokawa, mission planners directed the new mission to Ryugu, a C-type asteroid rich in carbon and other building blocks that formed the solar system’s planets more than 4.5 billion years ago. “Hayabusa was a technological demonstrator, so its main purpose was technology and the second purpose is science,” said Makoto Yoshikawa, Hayabusa 2’s mission manager at the Japan Aerospace Exploration Agency, in a phone interview last week with Spaceflight Now. “For Hayabusa 2, science is the main purpose. That’s the big difference. As of Wednesday, Hayabusa 2 was around 50 miles (80 kilometers) from Ryugu. 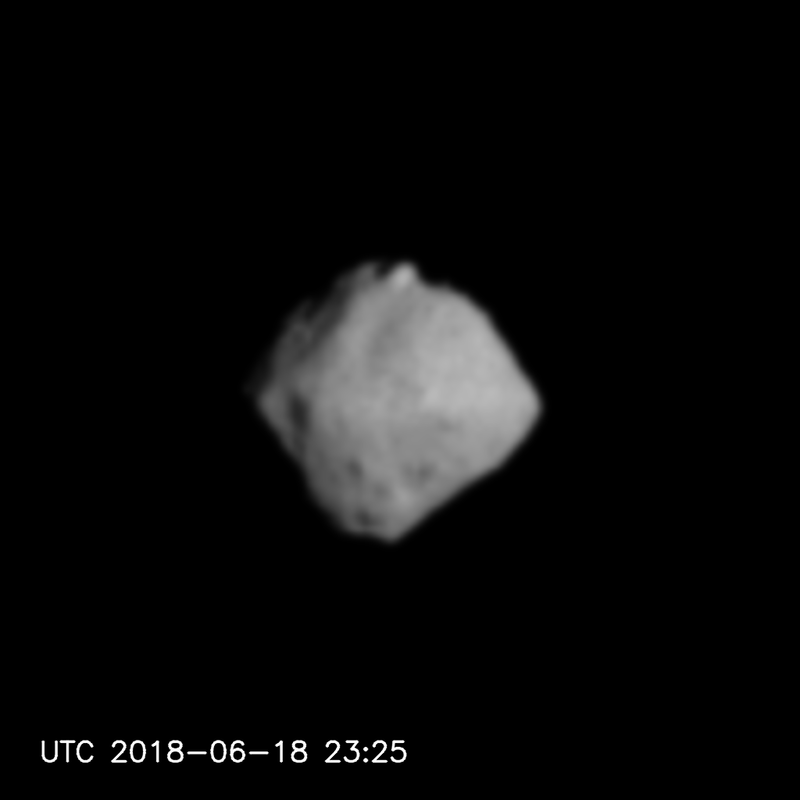 The spacecraft was closing the distance to the asteroid at a rate of a little more than a foot per second, a fraction of the speed of a typical walking pace. Hayabusa 2 and Ryugu are currently located more than 176 million miles (284 million kilometers) from Earth. Named for a dragon’s palace in a famous Japanese fairy tale, asteroid Ryugu completes one circuit of the sun every 1.3 years, and its path briefly brings it inside Earth’s orbit, making Ryugu a potentially hazardous asteroid. 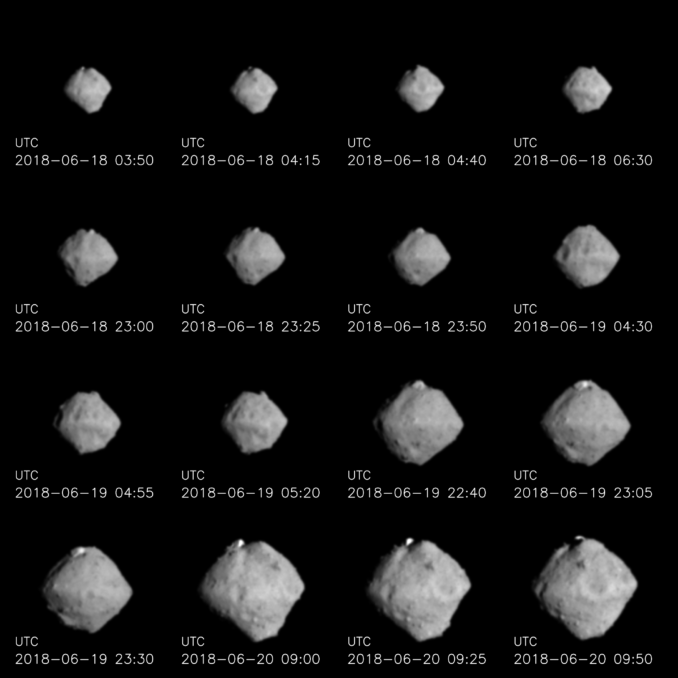 The Hayabusa 2 spacecraft switched off its ion engines for the final time June 3, completing a near-continuous firing since January which reshaped the probe’s orbit around the sun to match that of Ryugu. The ion engines consume xenon propellant and generate low levels of thrust, but their fuel efficiency allow the thrusters to operate for long durations. Since turning off ion propulsion, Hayabusa 2’s conventional hydrazine-fueled thrusters have conducted several burns to fine-tune the craft’s final approach to Ryugu. 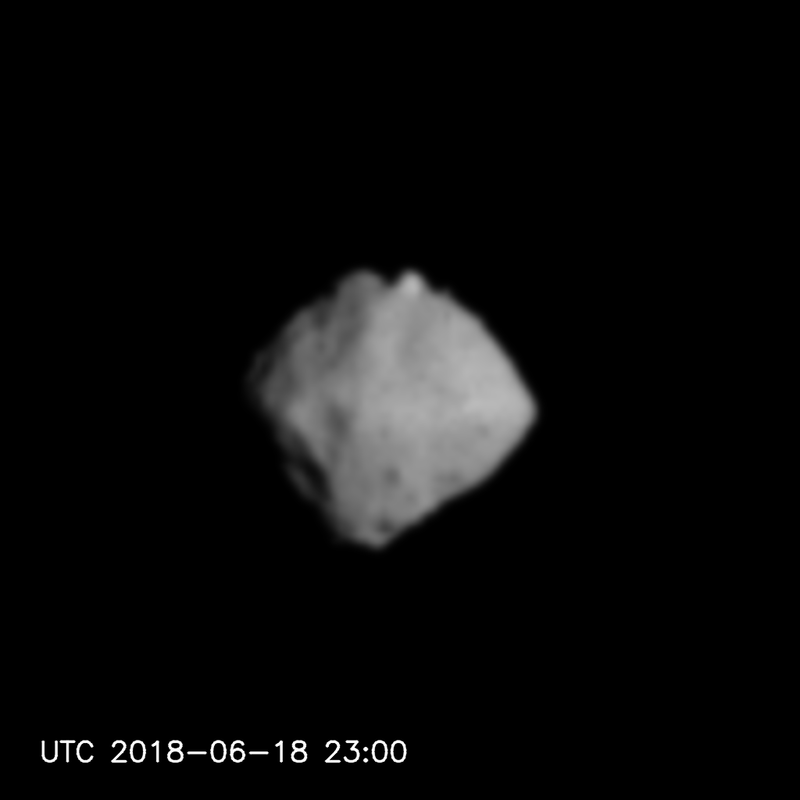 The trajectory correction maneuvers have slowed Hayabusa 2’s closing rate and steered the probe in a zig-zap motion intended to help ground teams pinpoint the asteroid’s exact location by mapping its movement against a backdrop of stars. The spacecraft’s optical navigation camera is capturing better views of Ryugu every day, showing scientists surface markings, craters, and the asteroid’s shape. 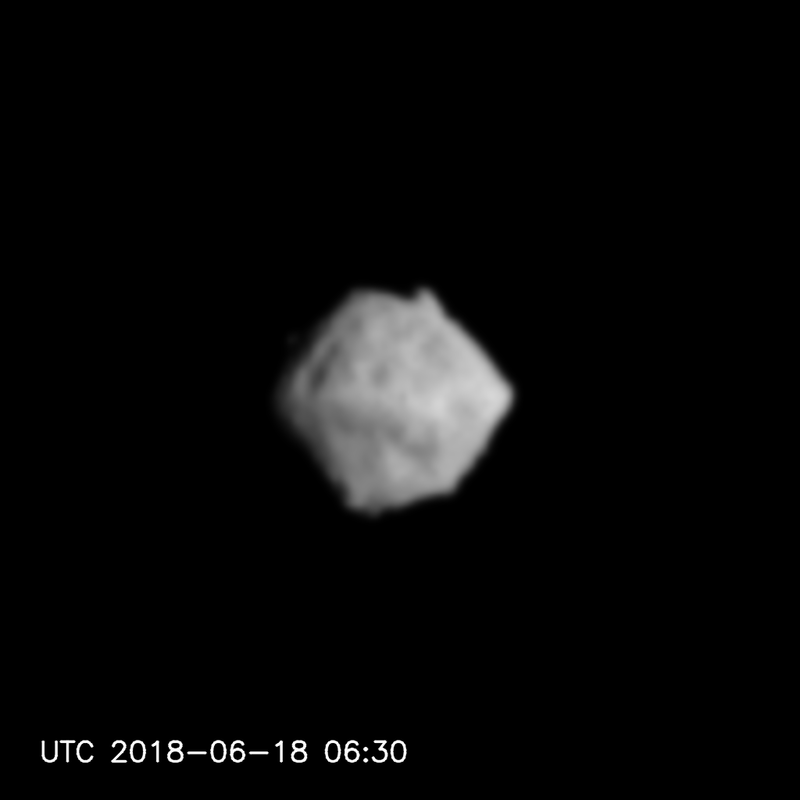 It turns out Ryugu rotates once every 7.6 hours, about the same speed which scientists estimated from ground-based observations. But Ryugu was too small to allow telescopes on Earth to see its shape until Hayabusa 2 moved close this month. 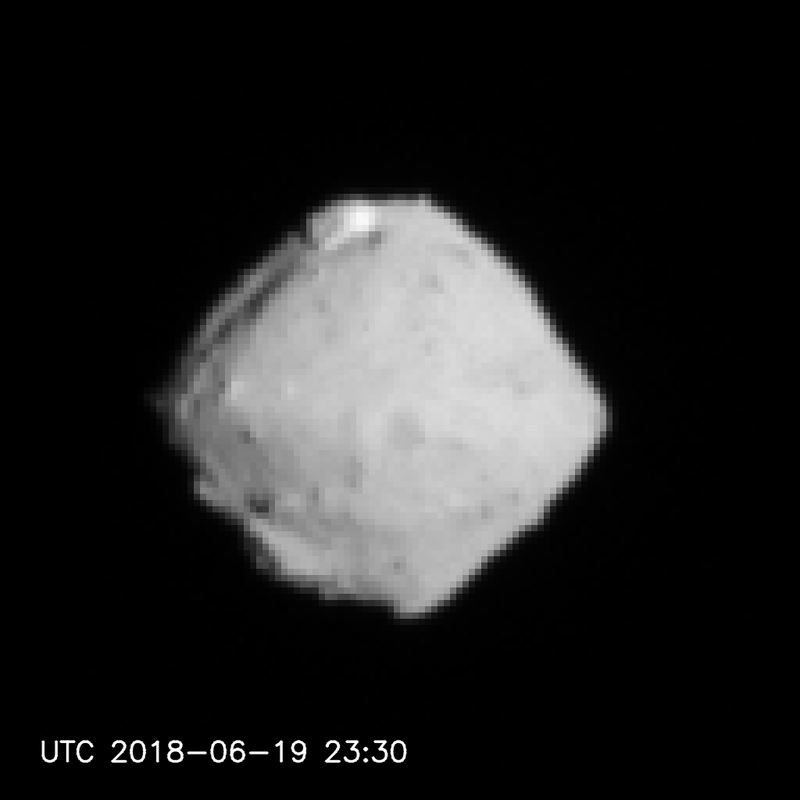 Scientists have noticed crater-like recessed landforms around Ryugu, and a bright rugged feature is visible on the upper part of the asteroid, as viewed from Hayabusa 2. 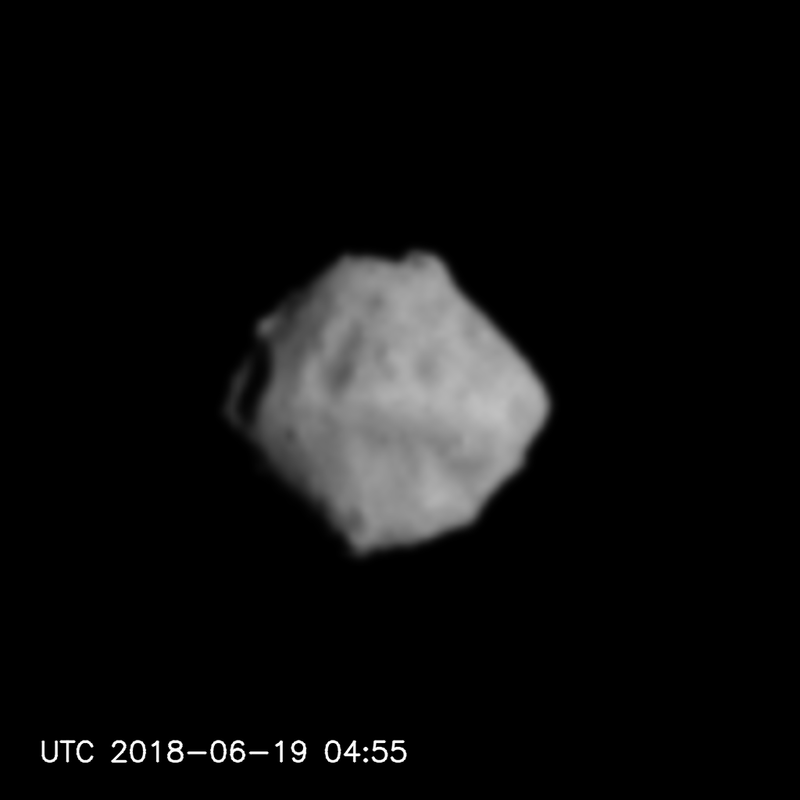 “As we approached Ryugu and were able to distinguish individual features in the asteroid’s topology, it became clear that Ryugu has a land of rich terrain,” wrote Seiji Sugita, principal investigator on Hayabusa 2’s optical navigation camera. “Numerous clusters of rock roll on the surface. Among these, a large rocky mass (about 150 meters across) stands out on the upper part of Ryugu due to its brighter color (higher reflectivity). Ryugu’s “spinning top” appearance resembles asteroid Bennu, the target of NASA’s OSIRIS-REx spacecraft set to arrive there later this year. 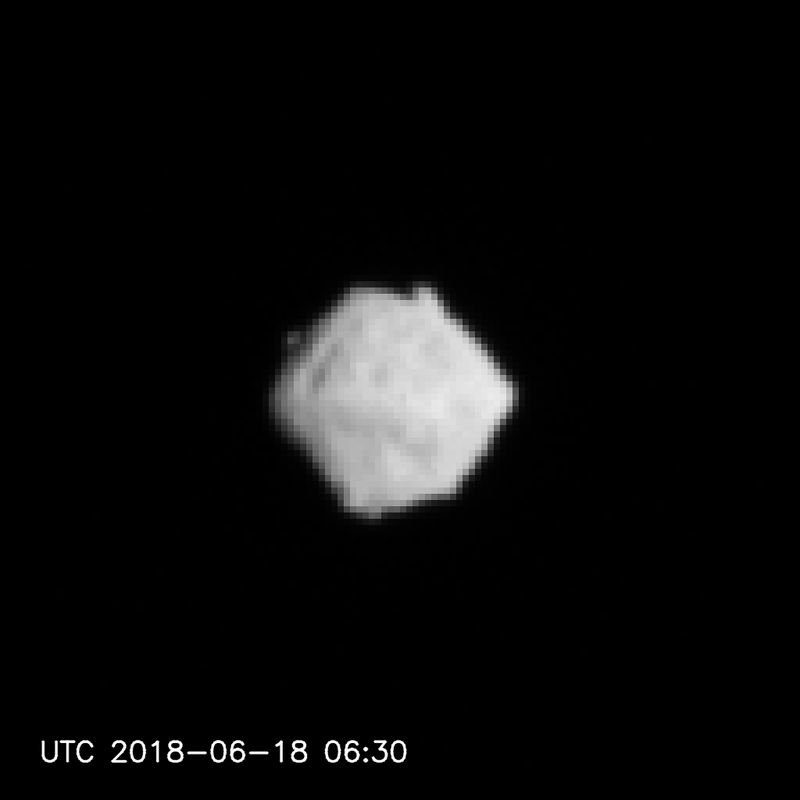 Bennu is roughly half the size of Ryugu, but scientists had better imagery of Bennu from a passage near Earth that allowed radars to bounce signals off the asteroid and reveal its shape. Researchers believe both asteroids contain lots of carbon, an essential element of organic compounds, but Bennu has a slightly different chemical signature, making it a rare B-type asteroid. Members of JAXA’s Hayabusa 2 team and NASA’s OSIRIS-REx team are collaborating in their asteroid exploration endeavors. The space agencies have agreed to share asteroid samples brought to Earth by Hayabusa 2 and OSIRIS-REx, and three U.S. scientists on the OSIRIS-REx team are assigned as co-investigators on the Japanese mission. In return, three Japanese researchers formally joined the OSIRIS-REx team. 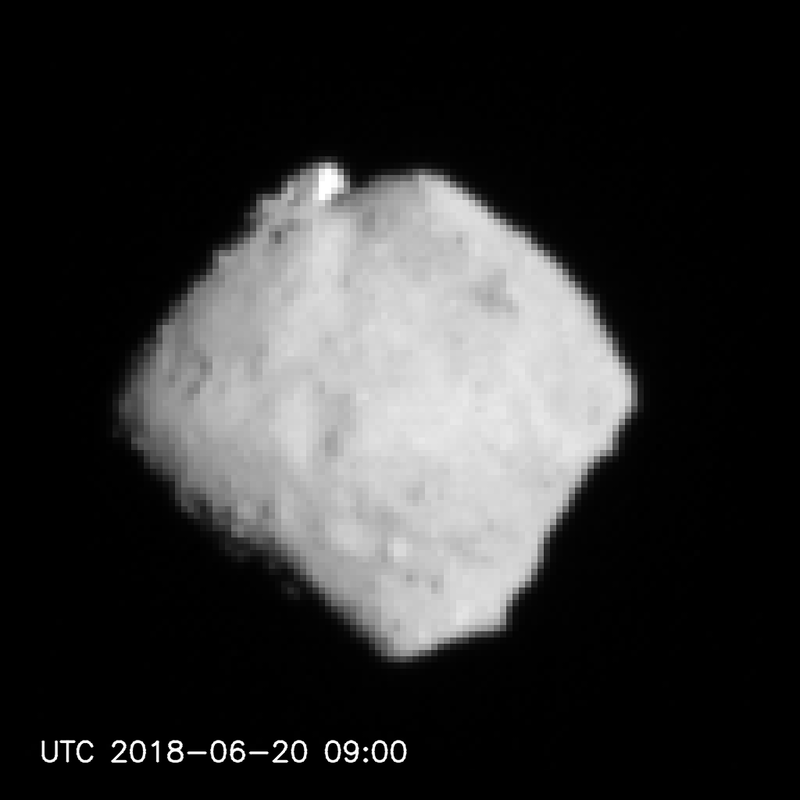 At first glance, Ryugu “looks like the spinning top like we think Bennu looks like,” said Dante Lauretta, principal investigator on the OSIRIS-REx mission from the University of Arizona. 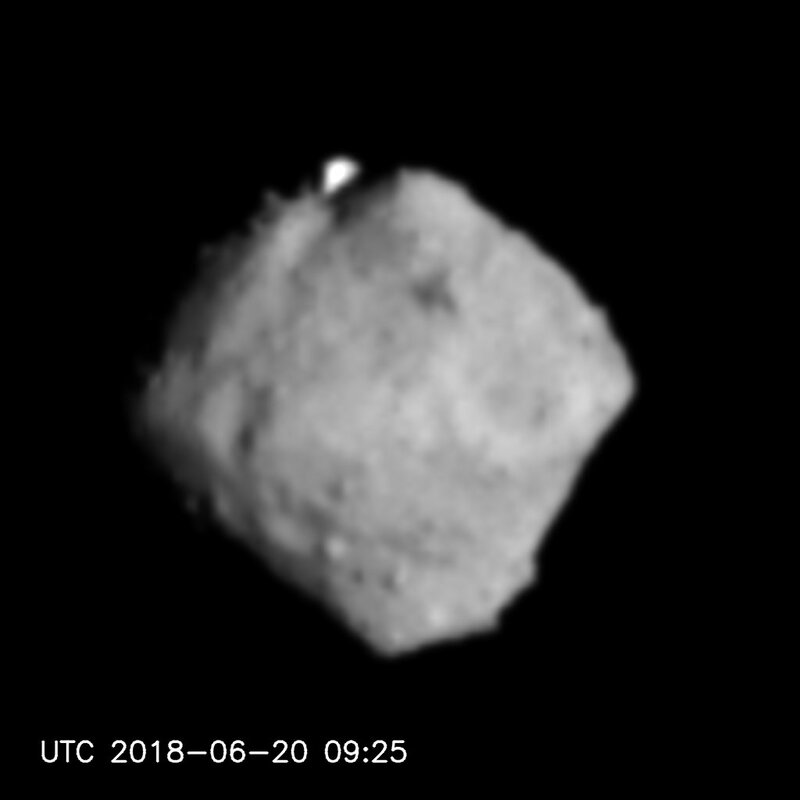 Ryugu’s gravity field is 60,000 times weaker than Earth’s, but the asteroid’s light gravitational tug is already exerting its influence on Hayabusa 2. Navigators aim to have Hayabusa 2 at a point around 12 miles, or 20 kilometers, from the asteroid June 27, officially marking the mission’s arrival. 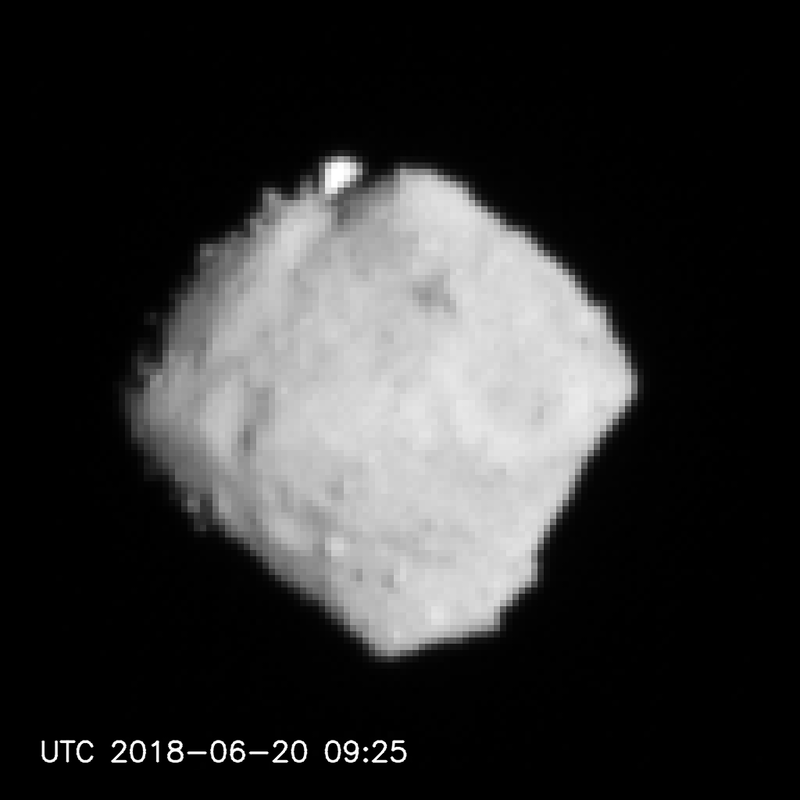 Then Hayabusa 2’s scientific instruments, which include a camera suite, a laser designed to measure topography, and a near-infrared spectrometer to study Ryugu’s composition, will begin their reconnaissance of the asteroid. After the initial survey, Japanese scientists will decide in August wh ere to send Hayabusa 2 to collect the first of three samples from Ryugu. The mission’s first touch-and-go landing on Ryugu is set for September or October. Hayabusa 2’s sampling mechanism works by shooting a small bullet into the asteroid after it descends to the surface. The projectile will fire while Hayabusa 2’s sampling funnel is in contact with the asteroid, and engineers the energy imparted by the bullet will blast bits of gravelly rock through a tube into a collection chamber for storage inside the mission’s return capsule. 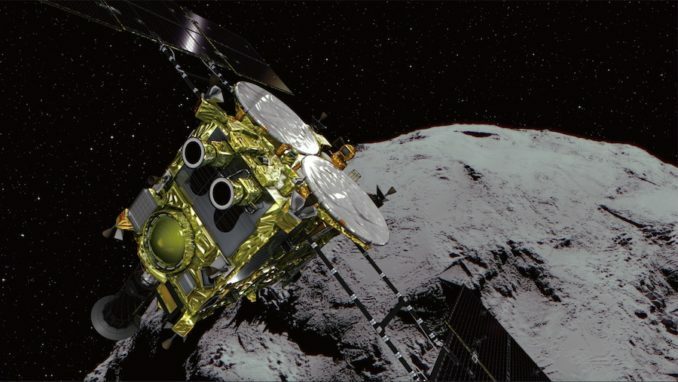 Hayabusa 2 carries four landers, including a 22-pound (10-kilogram) robot named MASCOT built by the same German-French team that managed the Philae comet lander deployed from the European Space Agency’s Rosetta mission for a touchdown on comet 67P/Churyumov-Gerasimenko in 2014. 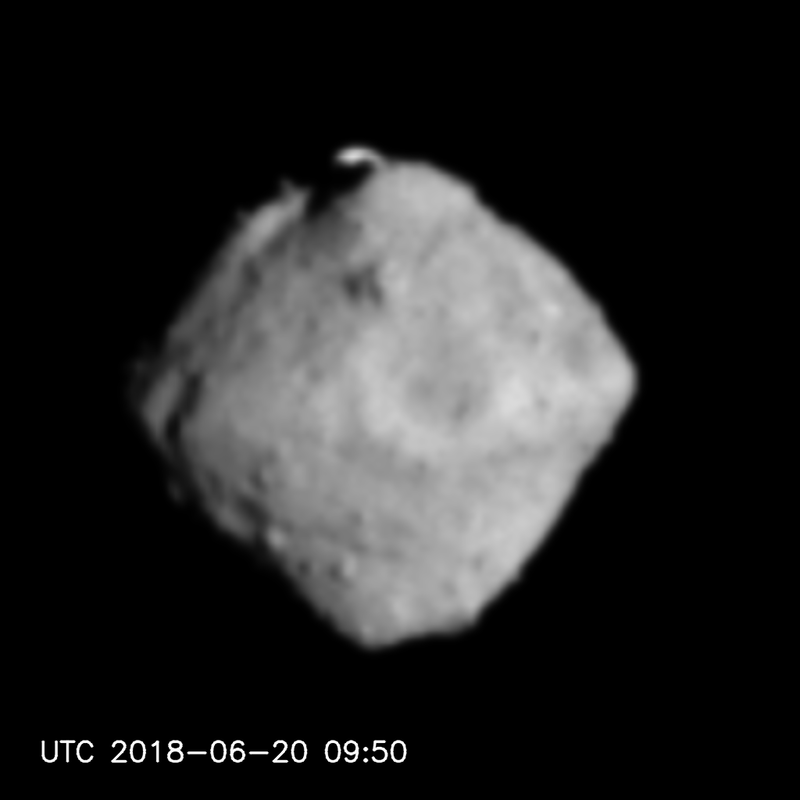 Yoshikawa said MASCOT should be released for its landing on Ryugu in early October. Carrying its own set of instruments and a camera, the robot is designed to bounce to several locations on the asteroid. The OSIRIS-REx spacecraft is se t to arrive in the vicinity of Bennu around Dec. 3, but the mission’s ground team will spend a year investigating the asteroid before going in for a sample collection in July 2020, with the specimens se t to return to Earth in 2023. “They’re going a lot more quickly than we are,” Lauretta said. “We’re not going to be making a sample site selection until more than a year from now. So we’re going to map and map, and think and process and analyze. They’re going to go in and have a site sel ected by mid-August, less than two months from now. That’s a very different approach to the issue. I’m curious and excited to see how they go about that. One of the three samples to be collected by Hayabusa 2 will come from material excavated fr om beneath the asteroid’s surface. 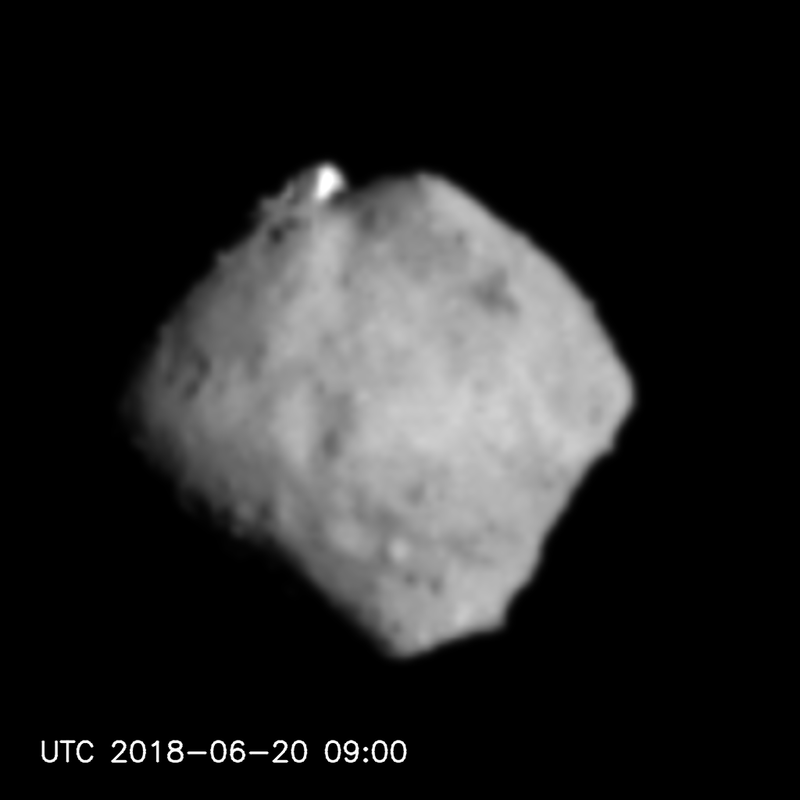 Hayabusa 2 will use explosives to fire a copper impactor into the asteroid to carve an artificial crater, exposing underground pristine rocks for the probe to pick up during a touch-and-go maneuver. Each of Hayabusa 2’s three asteroid specimens will go into a separate chamber inside the craft’s sample return canister. Hayabusa 2 is scheduled to depart Ryugu by the end of 2019, and the spacecraft will separate its sample carrier for re-entry and a parachute-slowed landing in Australia in December 2020. If all goes according to plan, Hayabusa 2 should bring back at least a gram of asteroid material for detailed analysis in laboratories on Earth.